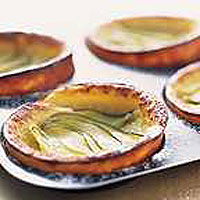 These popovers, the American name for batter puddings, are simple to prepare and are delicious served hot straight from the oven with a dollop of Greek yogurt. The easy-to-make batter flavoured with stem ginger and syrup makes it light on the calories. Preheat the oven to 220°C, gas mark 7. Sift the flour into a bowl and mix with the icing sugar. Make a well in the centre and break in the egg. Add half the milk and gradually work into the flour with a wooden spoon. Beat the mixture until smooth, then beat in the remaining milk. The batter should be smooth and creamy. Stir in the ginger and lemon rind mixing in well. Place a little butter in each compartment of a 4 hole Yorkshire pudding tin. Heat in the oven for one minute until the butter has melted, taking care not to let it burn. Pour the batter into the pudding moulds and add the sliced pears, divided equally. Sprinkle each with golden caster sugar. Bake for 20-25 minutes until risen and golden brown. Serve dusted with icing sugar and Greek yoghurt.